Now, we have to preface this all by remembering that the draft was only eight months ago and we are a long way from knowing how any of these players will end up. With that said, I have one thing to say to the 25 teams that passed on him – you should have drafted Alex DeBrincat. I’m not going to absolve myself from this – I saw DeBrincat as a flawed player riding a high shooting percentage and stated on more than one occasion that I didn’t think he was more than a long shot to be an impact player in the NHL. I was wrong. I had him as the 40th best prospect on my final draft list last June – one spot later than he was actually drafted. Looking back I have to wonder – what was I (and NHL executives) thinking? Alex DeBrincat started the season on fire. 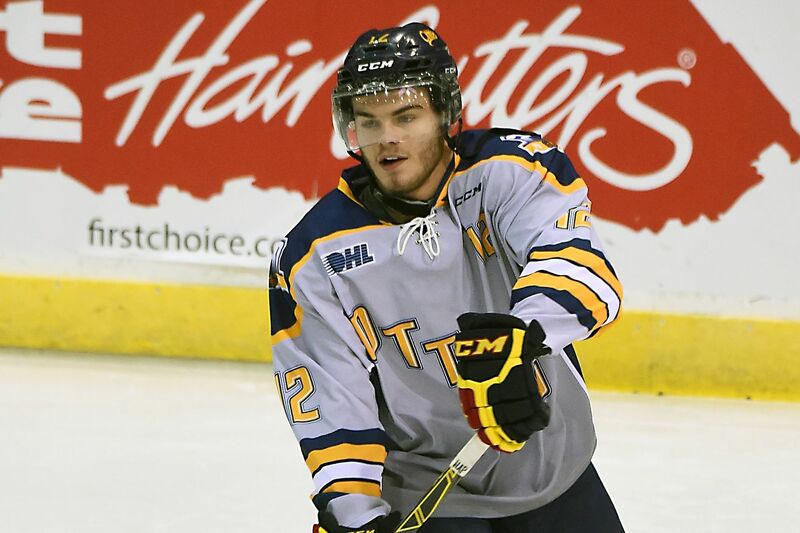 Hoping to prove that he wasn’t just a byproduct of Connor McDavid, DeBrincat put up obscene goal totals through the first few months of the OHL season. Why isn’t he ranked higher? “It’s another example of the size-bias among scouts” was the common refrain. The fact is DeBrincat was never as good a prospect as his goal total suggested and he should not have been thought of close to the top-10. After an underwhelming performance at the World Juniors, DeBrincat had a bad January and just didn’t look like the same player we saw before Christmas. He seems like the kind of player that when things aren’t going his way and his confidence dips, it’s hard for him to snap out of it. There is no doubt that DeBrincat has very good scoring ability. He is a high-volume shooter (currently sits 3rd in the OHL in SH/Game) that can find open space and put himself in a position to take advantage of scoring opportunities. He has a great nose for the net but his puck skills leave much to be desired and he won’t often create offense for his linemates. He doesn’t play like the typical small-winger we’re used to seeing. He doesn’t have the crazy speed an allusiveness of a guy like Johnny Gaudreau or Jiri Hudler. He’ll never be a top line offensive cornerstone but DeBrincat may be the perfect pick for a good team selecting late in the first who can plug him into the lineup in a few years as a secondary offensive option. That’s what I wrote a year ago with about a month left in his second OHL season. DeBrincat finished his incredible draft year tied for 7th in league scoring (with Travis Konecny) having scored 51 goals and adding 50 assists. It wasn’t enough to change the minds of NHL scouts. He had been playing with a chip on his shoulder for two years after not being drafted into the OHL – now it was about to get bigger. Despite leading all draft eligible OHLers in primary points during his draft season, DeBrincat wasn’t selected in the first round. How has he responded this season? DeBrincat is putting himself in the record books. This week, Alex DeBrincat became only the eighth player OHL/OHA history to score 100 points in three straight seasons. He currently has 47 goals through 48 games this season with three more, he will become the first OHLer to reach the 50 goal mark for three consecutive season (Dale McCourt did it back in the OHA). He has an 11 point lead in the OHL’s scoring race and trails only teammate Dylan Strome in terms of points per game. He’s one of the best goal scorers in the history of junior hockey and people STILL doubt him. As for DeBrincat, Team USA view was he didn’t show well in either summer camp or this final selection camp. When the World Juniors came around this past December, USA Hockey Kessel’d him. DeBrincat was inexplicably left off of the American team because he doesn’t ‘look good’ – lucky for them they won despite this ridiculous blunder. USA Hockey isn’t alone. Just last month, ESPN’s Corey Pronman listed his top-50 NHL prospects – despite his record setting season, DeBrincat did not make the cut. He’s Chicago’s best prospect and in every trade discussion the Blackhawks have before the deadline, it’s almost a certainty that his name will be brought up – at least it should be. Twenty-five NHL teams passed on him last June, nine of them did it twice. Not every team that passed on DeBrincat made a mistake – he probably shouldn’t have been a top-15 pick – but the ones drafting late in the 1st or early in the second definitely did. When the Leafs selected Auston Matthews first overall, they knew they had already won the draft. As a result, when the 31st pick rolled around they knew they could roll the dice. Instead of drafting the diminutive winger that scores the lights out, they bet an overeager that is 9 inches taller than him. Some will say that with Jeremy Bracco and Dmytro Timashov already in the system, maybe DeBrincat could have been seen as redundant – that’s not a valid argument, he’s better than both. I’m not picking on the Leafs. The Winnipeg Jets had Patrik Laine in his back pocket with a second first round pick to splurge on – they wasted that pick on a stiff playing in the same league as DeBrincat. Logan Stanley is a foot taller than DeBrincat, he has NHL size and all the old-school attributes certain scouts look for. The problem his he stinks – the Jets blew it. They’re not alone. It’s starting to look like half the league blew it when they passed on DeBrincat. There are guys you’d still draft ahead of him in the 15-38 range – Steel, Chychrun, Fabbro, Borgstrom – but like DeBrincat, the list isn’t that big. All too often NHL executives and scouts try to outsmart the numbers, they can watch a kid play and get a ‘feeling’ about him. Of course there’s more to talent evaluation than what is on a kid’s EliteProspects page – stats aren’t everything. At a certain point the numbers DO matter – especially when they are historically high as DeBrincat’s are. Sure, he doesn’t play with speed and impressive puck skills to his game like others his size – though is skill with the puck has improved significantly this season. He can look ugly and unpolished on the ice at times. None of that means he can’t find a way to succeed at the next level. As impressive has he looks right now, he could still end up being the next Rob Schremp, but I’ve doubted Alex DeBrincat long enough – I’m not going to do it anymore. You probably shouldn’t either.